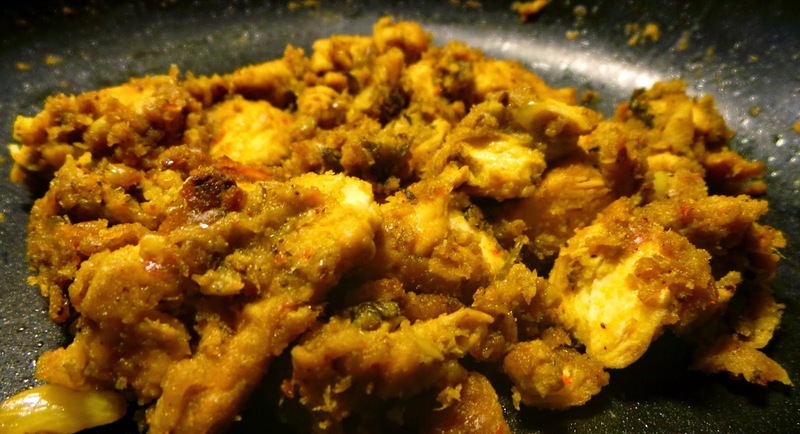 This chicken can be made both into fried dry form, and in a curry form. I made it in the dried form and used as appetizer. I will explain both methods: for dry and for curry. Add all the ingredients except chicken in a mixer and grind to a smooth paste. Alternatively the spices can be crushed in a mortal-pestle and added to the rest of the mix. Marinate the chicken in this mix for 2 hours. Heat oil in a pan and add the chicken pieces one by one without the marinade to the pan and fry from both sides for 5 minutes. Add the remaining marinade to the pan and mix well. If making a dry fried chicken, mix well all the marinade with chicken and turn the heat to low. Let cook for about 20 minutes, stirring and turning in between so the chicken or masala doesn't stick to the bottom of the pan. 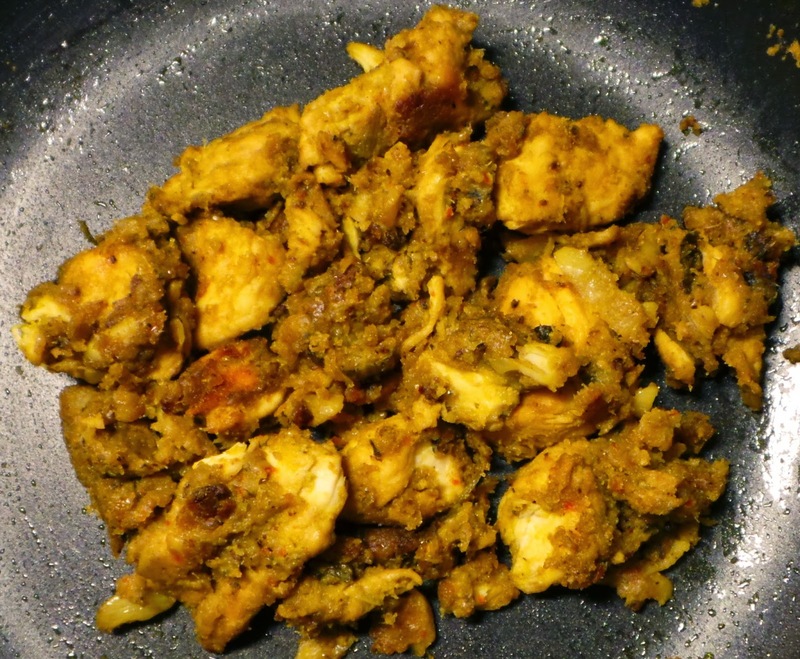 The complete masala will be incorporated in the chicken pieces and will taste heavenly. When the masala gets dried up and no more moisture is left in the pan, turn off the heat and serve as an appetizer. If making in a curry form, after adding the marinade, mix well and let cook for a minute. Add tomato puree of one tomato and add some garam masala. Mix well and let the tomatoes cook for about 2 minutes. Add half a cup of water and cover. Remove cover after 15 minutes, mix and cook on open flame for 2 more minutes. 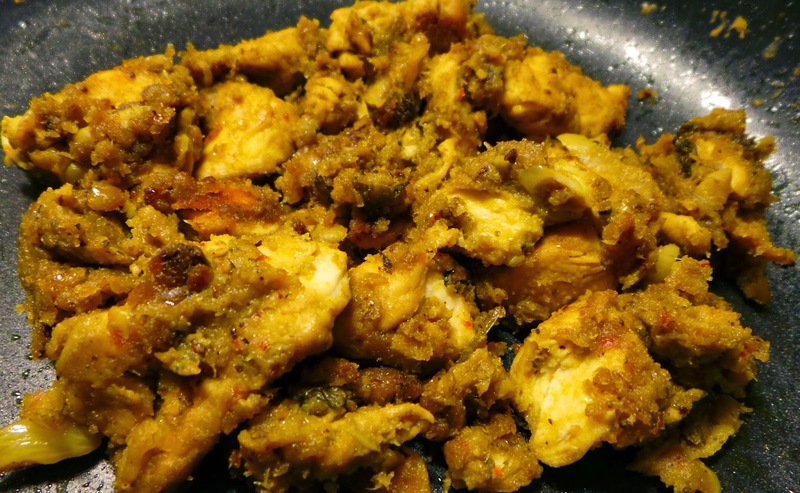 Turn off the flame and serve hot as a lehsuni murgh curry.